In spring of 2014 artist Julian LaVerdiere was interviewed by Skidmore College students Lindsay Camp ’14 and Siwei Song ’14 about his work Lost Cornerstone, 2003, in the exhibition One Work. Julian LaVerdiere is a production designer and artist whose work often blurs the line between the commercial and art worlds. 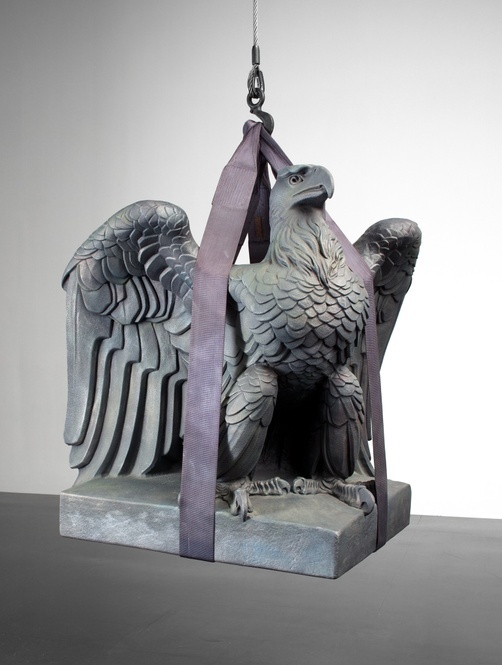 Intrigued by the intersections of history, science, and commerce, LaVerdiere creates large-scale sculptures and sets that often explore symbols of imperial power, such as the Roman eagle. Lost Cornerstone replicates the only surviving eagle sculpture from a group of twenty-two that once adorned the pediment of New York’s Pennsylvania Station. Designed by McKim, Mead, and White after a great Roman bathhouse, and constructed in 1910, Pennsylvania Station was razed in 1963 to make way for the current Madison Square Garden and Pennsylvania Plaza. In 2002, together with a team of artists, architects, and New York City organizations, LaVerdiere created the public art piece Tribute in Light, an annual light memorial that shines September 11th and 12th near the World Trade Center site. In 1996, he co-founded Big Room LLC, and in 2007, he founded Julian LaVerdiere Design Ltd., where he conceives and engineers elaborate environments, sets, and special effects for print advertising, public events, commercial television, and feature films. LaVerdiere, Julian. “Julian LaVerdiere on Lost Cornerstone, 2003.” Interview by Lindsay Camp and Siwei Song. 2014. Tang Teaching Museum collections website, last modified October 19, 2018. (https://tang.skidmore.edu/collection/explore/26-julian-laverdiere).